I recently acquired an Allwinner A13 unbranded tablet in order to port Replicant to it: this platform is well supported by free software (the Linux kenrel and the u-boot bootloader) and there is an active community of developers working on free software for the Allwinner A1x platforms: linux-sunxi. The tablet I ended up with contains an Elan EKTF2000 touchscreen, but I couldn't find any touchscreen driver for it in the linux-sunxi kernel tree: the source code was just not released, even though it's marked as being GPL-licensed. Moreover, since the tablet is unbranded, there was no one I could contact to request source code. So I asked around, and it turned out that nobody knew about source code that would have been released for that touchscreen. 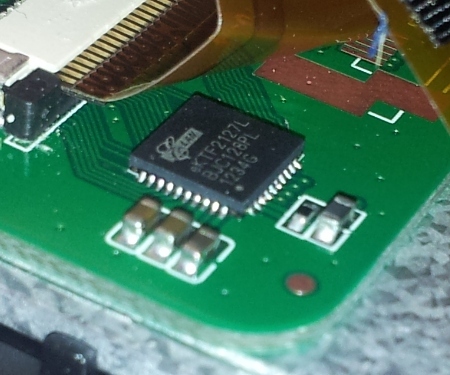 However, the tablet came with Android preinstalled and there was an ektf2k.ko module. After some research, I finally found a driver for elan ktf2000 touchscreens written by HTC. It seemed to match mine (both use I2C) and preliminary tests revealed that the same protocol (on top of I2C) was used by my touchscreen. However, it was not quite enough to write an usable implementation for my device: as a matter of fact, the returned coordinates from my touchscreen did not match the screen size: it reported values up to 896x576 while the screen size is 800x640. So the whole issue was about figuring out these values (896 and 576) at run time in order to scale down to the actual screen size. Which meant that this driver had the code to get the values from the touchscreen chip. I quickly understood how the touchscreen protocol works by reading the HTC driver, and it turned out that requests were arrays of 4 bytes, with the first one set to 0x53 (indicating a request) and the second one set to a particular command (indicating what we request). Now considering that requests are usually static tables that are defined in code (that's the way it's done in the HTC driver), declared at the beginning of the function, I knew that the static array of 4 bytes corresponding to the request for the size I needed to find out was held somewhere in the ektf2k.ko module. Looks very much like static arrays of data with the first byte set to 0x53! So I tried issuing requests with the commands 0x00, 0x60, 0x63 and 0xf0 and received the height with 0x60 and the width with 0x63! It was not in the most obvious format but 576 is 0x240 and 896 is 0x380, so it was easy to see that the responses were containing these values. In the end, I completed my implementation, and I now have a fully working touchscreen (with up to 5 contact points) with the free software kernel! May I know what was your kernel version?. We tried your patch for sunxi kernel version 3.0.57 and it did'nt work. Have you cloned from https://github.com/linux-sunxi ?? if yes, which branch ? @sachin: It was the sunxi-3.0 branch from the linux-sunxi tree. In any case, this should be fairly easy to fix as it only adds a file and modifies Kconfig/Makefile. Yes, you patch adds a new file 'ektf2k.c' and modifies Kconfig & Makefile. I think I have to pull recent commits for sunxi-3.0 for your patch to work. I have posted the error in sunxi mailing list. Please reply to that as it will be more public.